We have a winner of today’s contest. 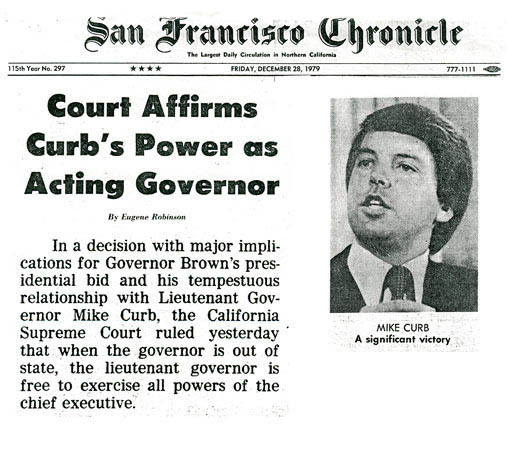 The winner noted that Mike Curb, shown here, was Lieutenant Governor during Jerry Brown’s first two terms in office in the late 1970s and early 1980s. One of the oddities of California political institutions is that the governor and lieutenant governor don’t run as a slate. So it is possible that the two come from different parties. Mike Curb was a Republican. Another oddity is that whenever the governor is not in the state, the lieutenant governor becomes acting governor with all the powers of the governor. (Communications were not easy when California was founded in the mid-19th century and state legal institutions seem not have have kept up with such technological advances as the telephone in this regard.) While Brown was out of the state running for president, Curb would assume full authority and would veto bills, issue decrees, etc., to Brown’s displeasure. Curb’s non-political career before and after public office was in the music industry and he was one of the writers of the song included in the contest. He was a product of the San Fernando Valley where at Cal State Northridge you will find the Mike Curb College of Arts, Media, and Communication.